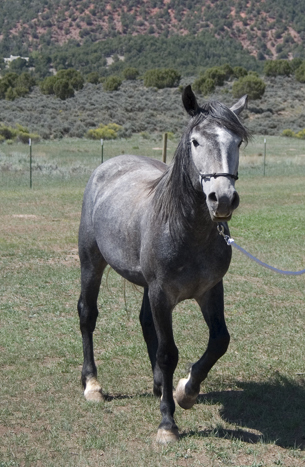 When I brought my friend Lloyd out to the ranch to meet Cello, Cello was really.. energetic. The minute we pulled in he galloped to the fence to see us. The minute we walked to the gate we gave him a rub and he galloped off to the back pasture (which is 2 pastures down from where he met us.) He ran. And ran. And gave me a heart attack because of gopher holes. But mostly, he was beautiful- and fast. I’ll add here as a side note that he was just playful, we had no problems catching him. That same week we took some photos of him galloping. I’ve posted a few on here already. That day he was fast, too, but not really booking it. When he really goes, he is faster than my OTTB Thoroughbred. That was the best way to describe it to my husband, who has seen him run but not whole-heartedly. So? The other day I was reading a book and came across this amazing story. It’s a bit long, but worth the read. To show off his skills and prepare him for battle, Indians sometimes raced the warhorse against cavalry steeds, pitting the small horse that scrounged for cottonwood bark in the winter against bigger, corn-fed animals. One story tells of the famous four-hundred-yard race waged by the army against the Comanche at Fort Chadbourne on the Texas frontie. The soldiers were disappointed when a Comanche chief appeared on what one observer described as a “miserable sheep of a pony.” They decided to give the chief a break, and instead of running their prize Thoroughbred mare, they brought out their 3rd best horse. With the 170lb chief aboard carrying a heavy club, the “sheep” easily won the race. The soldiers were embarrassed and asked for another, now bringing out their 2nd best horse. The “sheep” won again. Finally, the Americans brought out their best horse, and the bets were doubled. The Comanche chucked his club and gave out a yell. The “sheep” took the lead and held it. About 50 yards from the finish line, with horses at full gallop, the Indian turned his horse around and finished riding the race backward, taunting his cavalry rival as his pony handily won for the third time. I was excited to find that passage right after saying Cello was faster than my TB, who stood about 16.2. She wasn’t an awesome racehorse, granted, but still. If you don’t want to read about books/my quick review, scroll down to training stuff. 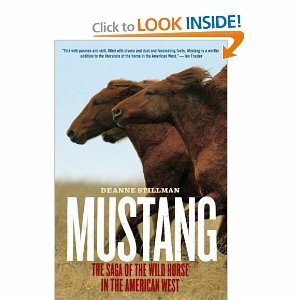 The excerpted quote is from Deanne Stillman’s book, which is lyrical and easy to read- a real feat for a book that is mostly, so far, on the history of the mustang. I am back in the days of cowboys (or rather cavalry) and Indians, and I am only 77 pages in, but I’ve learned a lot of history already. I highly recommend this as the first read on someone just learning about the breed- not about training or techniques, but just about the breed itself. In the foreward the author says she tries to tell the story of the mustang as it should be told- focused on the horses themselves. She did a remarkable amount of research, so far profiling individual horses from as fast back as the Conquistadors. The individual stories tie into the larger picture and keep the book from drying out. 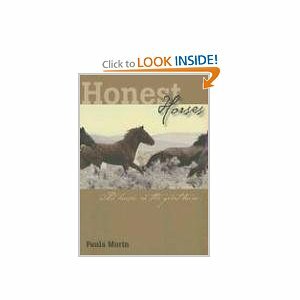 Honest Horses is a collection of essays written from multiple point of views on relatively current issues surrounding the wild ones. So far it is BLM P.O.V. heavy, but the arguments are well rounded and supported, not just random opinions spouted off without basis. I am only a few essays in, but I couldn’t imagine a more comprehensive starting point for really learning the issues. It was published in 2006 so is more relevant than some older texts- and of course, it is not the end-all-be all but rather and opener to understanding. It’s already given me a lot to think about and shocked me with the scope of the trouble. I finally got a hold of Justin Dunn after a week or so of phone tag. Cello is set for about 14-15 rides with Justin in the beginning of November. I am really excited- Justin said he would do a foundation refresher, and was positive about reaching our goals, which are simple. Balance, even leads, light on the bridle. I can’t wait to learn his methods. Everyone from EMM speaks highly of him. He said we would probably do most our work bitless, and that we would have Cello sidepassing 30 feet in each direction without force. I eventually want to get Cello in liberty reins (way down the road) so I’m excited about the bitless part. For an English girl that is a foreign concept! We are also set for a month with Jessica Dabkowski (winner of Ft. Collins EMM, previously posted about) in January. We were maybe going to do December if a spot opened up, but financially I will need December to recover from Justin (expensive, but I have no doubt he is worth it.) She definitely approved of the 2 weeks with Justin- I ran it by her since I had gotten a hold of her first and didn’t want crossed wires/different training styles. I was going to write more about where Cello & I are at, but I will save that for a new post with new Cello photos. All is well! This entry was posted in New Things/Breakthroughs, Outside Stories and tagged Blm mustang, Cello, dani, deanne stillman, Extreme Mustang Makeover, honest horses, jessica dabkowski, justin dunn, paula morin, skylark therapy, wild horse problems, wild horse project. Bookmark the permalink.